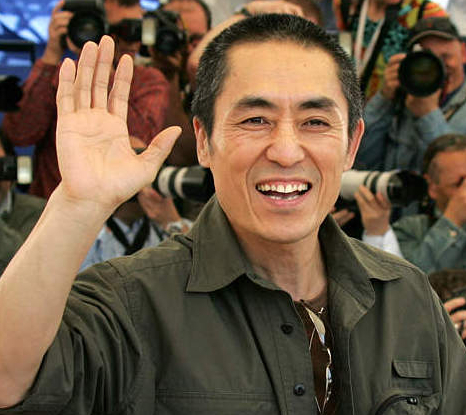 Zhang Yimou (張藝謀), China’s most famous film director and the creative force behind such diverse projects as the recent Chinese blockbuster melodrama The Flowers of War, the 2008 Beijing Olympics opening ceremonies, and the martial arts action hit Hero, is now said to be setting himself up with his own production fund. Zhang recently ended his collaboration of more than a dozen years with Zhang Weiping, owner of New Horizon pictures, to hang out his own shingle and presumably retain greater creative and financial control of his films. According to a source in China, several major production companies such as Beijing Galloping Horse and Wanda Film (a subsidiary of Wanda Group, which recently acquired AMC Theatres) have been jockeying to collaborate with Zhang. Wanda has reportedly offered him 200 million yuan (US$31.5 million) as a signing bonus. But Zhang wants to work only for himself, and so he has reportedly aligned with an entertainment-focused private equity fund to establish a financial platform to fund films and large-scale art productions. Early rumors have indicated that Zhang and his investors intend to raise 2 billion yuan (US$315 million), and that they have already received commitments for 10 percent of that amount. The private equity group, Kunhong Media, has apparently been caught off guard by what they characterize as a leak of the news of their “sensitive” negotiations with Zhang, and the owner of the company stated that rumors have exaggerated the details and scope of the potential partnership. Zhang Yimou’s talent agency, CAA, declined to comment. It would be easy to dismiss the rumors were it not for Zhang’s unique status in China’s film industry and culture. With nearly two dozen film directing credits on his resume spanning 25 years, Zhang is about the closest thing there is in China (along with director Feng Xiaogang) to a guaranteed box office draw, and he is the only Chinese director to have had multiple films succeed in the international marketplace. In Chinese film industry circles it is conventional wisdom that Zhang can raise money for virtually anything he wants to do. Zhang began his career 30 years ago after graduating from Beijing Film Academy as a member of the storied “Fifth Generation” of Chinese filmmakers. Along with other famous Fifth Generation comrades like Chen Kaige and Tian Zhuangzhuang, Zhang spearheaded a wave of innovation in Chinese cinema, abandoning traditional story-telling methods for more unorthodox approaches. Their films took the festival circuit and art-house world by storm. 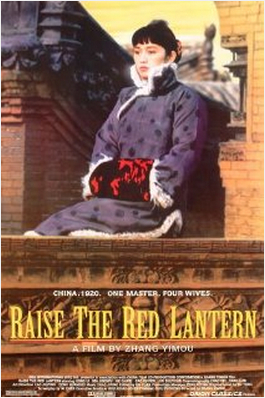 Zhang’s early ‘90s films like Ju Dou, Raise the Red Lantern, The Story of Qiu Jiu, and To Live, were recognized with a Grand Jury Prize at Cannes and other major awards including Berlin’s Golden Bear, two BAFTA awards, and Venice’s Golden Lion. A recurrent theme in Zhang’s films is the resilience of his characters in the face of hardship, and he is also known for featuring strong female protagonists. Two of China’s most famous actresses, Gong Li and Zhang Ziyi, were paramours of Zhang’s whose careers were launched by their debuts in his films. Although he claims that he is not interested in politics, Zhang found himself in a career crisis in 1994 when his critically acclaimed film To Live was banned in China by SARFT for its critical stance on the Chinese government’s policies. 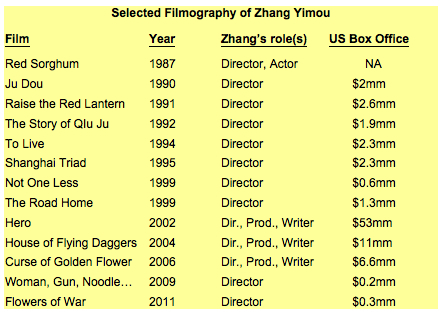 After an uneasy period in the Chinese filmmaker’s penalty box, Zhang emerged with a new focus on more populist, commercially oriented action films like Hero, which smashed Chinese box office records in 2002 and grossed $53 million in the U.S. His action films House of Flying Daggers and Curse of the Golden Flower also performed well both inside and outside China. Although his last few films have been less well received by critics than his prior body of work, their substantial ticket sales have helped to cement his status as a box office magnet, at least in China. And with his biggest ever mainland hit The Flowers of War just behind him (whether the film actually returned a profit to his investors is another matter), the timing couldn’t be better for Zhang to shake the money tree and gather enough renminbi to allow him to continue making films for as many years as he desires. This entry was posted in General News, Opinion by chinafilmbiz. Bookmark the permalink.